QR Code for this blog. Try it! Augment - "to enlarge or increase" Wordnetweb. 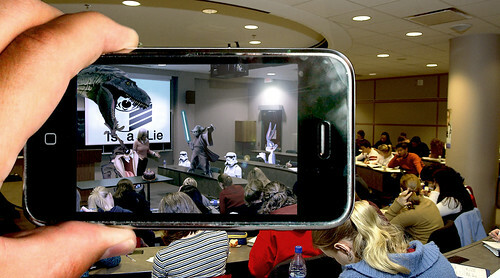 Augmented Reality(AR) "describes the enrichment of the real world with the virtual. hyperlink - "a link from a hypertext file to another location or file; typically activated by clicking on a highlighted word or icon at a particular location on the screen"
We are moving from a world of hyperlinks to hardlinks as the web moves from the computer screen to the world around us. We've experienced the convergence of technologies with one another. Prepare as technology converges with your coffee mug, stapler, the papers on your desk, and your real life everywhere you go. Welcome to Augmented Reality. Don't be afraid, the concepts are pretty simple. Augmented Reality 101: How Do we HardLink the Physical World to the Virtual World? Called "location based" - this has not only given us GPS units with turn by turn instructions but it has given us "location based apps" like Foursquare and Gowalla. Facebook has now enabled location-based check ins. Turketom's photo stream - Flickr - Some rights reserved. Most location based app games still required "check in" where the user clicks and states a desire to log their location either privately or to share with their friends. After testing many of these apps over the past two years there is definitely a private way to use these. Don't equate location based with "stalker" - you can do it well. The fear here is when people use this in an uneducated way. There are some cool apps that overlay twitter "bubbles" on the real world as you see where the people are who are tweeting. You could see a street scene, for example, and bubbles saying what they are tweeting through your cell phone's camera. This can be divided into two basic subsets: object recognition and the use of coding systems. I've used Noogle Noggles for my iTouch and it is pretty good at recognizing things that are technology related. In theory, you could snap a picture of an object and it would be "looked up" and we'd find out what it is. I've found this image recognition app works well with technology items like my remote in my room or a bottle of elmer's glue but things like shoes don't work. There are some cool search engines like tineye.com that are making progress with image recognition but this has a way to go. My Grocery IQ app uses the barcodes on packaging. When I run out of my son's favorite Teriyaki Beef Jerky for the thousandth time this month, I can scan the barcode and it puts it on my list (again.) This is incredibly useful for shopping. The "quick response" codes are the little codes that have me incredibly excited. I am requiring a QR code on the front of their paper portfolio this year that is a link to their online efolio. I can snap a picture with my cell phone or webcam and go right to the website. When my eighth graders made their toondoo, I had them turn in the toondoo for display and then include a QR Code in the top right corner (they just put all this in Word) so that others could comment online with their mobile devices. I'm incredibly excited about QR Codes and am already using them any time I display student work or have them turn in portfolios. My favorite QR Code app is i-nigma. These "radio frequency identification devices" are mostly for retail and asset tracking applications, this lets you do an instant inventory using a "radar" type of application. These tags send back their location. Eventually, it is said that you'll be able to walk out of a store and using this technology your debit card will be charged and your buggy will be rung up. There are some schools who are using this (albeit with privacy concerns) to track people and the location of students who are problems. Called the very first movie in "the Outernet" this Augmented Reality location-based movie gives us a glimpse into not only entertainment but how our field trips could be augmented with some amazing apps that add layers or experience on top of learning environments like museums or historical locations. The Augmented Reality Trophy Case. For example, a use that we came up with when we did our Augmented Reality Lesson plan with my eighth grade keyboarding class was that we could take our school trophies and have a QR code linking to a video about winning that trophy. So, for example, when one stood at a trophy case, they could see our State Literary or State football trophy from this year and link to our Youtube Channel about winning that trophy! Trophy cases would no longer be dead dusty trophies that no one remembers but living breathing stories. My friend and QR Code Expert from down under Mr. Robbo the PE Geek uses QR codes that he's printed and put on a skeleton in his health class. So, as the students are reviewing the bones on a skeleton, they can snap a picture of the qr code to check themselves. Foursquare announced layers some time back with the first two by the Independent Film Channel and the Huffington Post. Stephen Anderson (@web20classroom) and I had a long discussion about this last summer at ISTE and even reached out to Foursquare and Gowalla about helping us create a privacy-rich layer for K12 education. Anyone who will listen including the Smithsonian and Discovery have been people that my friends and I have talked to about location - based learning. At some point, someone will "get" the potential for this educational layering with a heavy emphasis on locking down user identity and location and we will have educational layers upon our planet. A trip to the park or parking lot could turn into a rich learning experience where we carry our resources our phone and become untethered to the unnatural environment of the classroom. Will this be the end all be all? The BIGGEST reason to teach this is that Facebook has enabled LOCATION BASED check ins and kids can now send their location to several thousand of their friends. Now that, my friends, scares me. I'd a lot rather them be on Foursquare with twenty well chosen friends and locked down privacy settings than on Facebook with 1,000 friends that they picked indiscriminately. They also need to understand where the web is heading so they can make career decisions and have a method for decoding technology change. I generate QR codes and put them all over my room. From the Old Spice Guy to the Hammer Dance Flashmob to funny text messages "You rock, you read my QR code! How dare you! ;-) to the school's phone number. I have them go on a QR Code Scavenger hunt with the purpose of decoding how many types of things you can encode on a QR Code reader. I give them a one week warning to download a FREE QR Code reader onto their cell or iPod and get in pairs (so everyone can use it.) I share all the content I've given you here to help them understand augmented reality. Why do students need to understand this? So, for those of you who need simple reasons to take new technologies to your curriculum directors and administrators. Here they are. Facebook has enabled location based check in (part of augmented reality.) They need to know how to be safe. Understanding augmented reality will help you. Foursquare is today where Twitter was three years a go, in my opinion. Learn it. (Many report that Gowalla is more fun so try it too.) They can understand something before it happens. It can be very useful for teachers who need to link printed papers to online material. It makes going to those URL's a snap and provides a permanent hardlink to their work. You can now engage those nature-based and bodily kinesthetic learners. We started with geocaching but now we can use apps to do the same thing in more realistic and meaningful ways. The classroom is moving out of the classroom. You can link your classroom to your online content. If you have online materials for them to study later, put a QR code up on that smartboard and let them snap a picture to study later on their iPod Touch or smartphone. I hope you share in the comments what you're doing with QR Codes, there are certainly many experts inthis area that I've cited already.